While in Quincy, MA, I drove by a couple of clam shacks on Wollaston Beach. The logical result was a hankering for a lobster roll. First thing I did, was search reviews for the best lobster roll in Quincy and the reviews seemed almost unanimous, that Tony’s Clam Shop had the goods. I went to Tony’s on a Tuesday night and when I got there it was surprisingly busy, but not crowded. Then again, it was a beautiful night and Tony’s is right across the street from the beach, so it made sense. One nice perk to Tony’s is that it has a parking lot in back, which made going there easy. There is also plenty of street parking on the opposite side of the street. The first thing I noticed upon exiting my car in the back parking area was the stinky, fishy smell of old, thrown-out, seafood. I know that sounds disgusting, but you only get that smell when the seafood is fresh, so I took it as a good sign. As I climbed the stairs to the restaurant, I delightedly saw the outdoor seating. There was plenty of it and it faced the water, so I knew that’s where I was going to eat. When I opened the door to Tony’s I immediately smelled frying oil and batter. That’s the type of place Tony’s is. They, for the most part, serve fried, fresh seafood at semi-reasonable prices. Inside, at the counter, a friendly staff member quickly took my order after I thought about what I wanted. He quickly handed me a pager shaped like a lobster that would go off when my order was ready (see below). I ordered the lobster roll, a small order of clam cakes, and a stuffed clam, just to get a sense of the quality of the food. These clam cakes were pretty good. Not too big, not too small. Not the best I’ve ever had, but solid clam cakes. They were fried to a deep golden brown, so that the outside remained consistently crispy, but the insides were still soft. A few of the pieces had good chunks of clam, while some of the other pieces didn’t seem to have much clam at all. 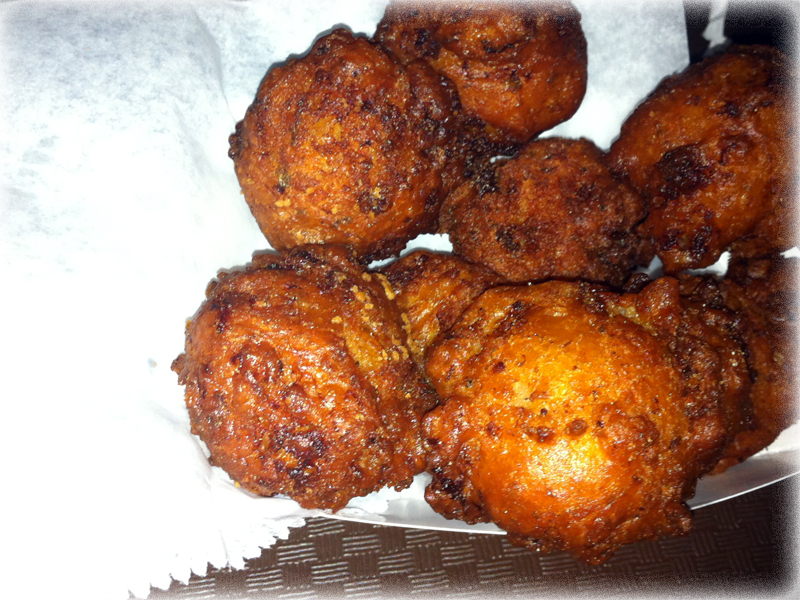 The really different detail to these clam cakes is that they had a good amount of spices added as well. They weren’t too salty, but they did have a blend of spices that was noticeable, but hard to identify. I also tried the clam cakes with tartar sauce and hot sauce. The tartar sauce went better with them than the overpowering hot sauce, but generally, I prefer chowder with clam cakes. That was the one big draw back to Tony’s. They have every seafood you could want fried, but they didn’t seem to have any chowder on their menu. Unlike the clam cakes, I didn’t really care for the stuffed clam. It was definitely over-baked so that parts of it were tough around the edges. I could get passed that though, but the stuffing also had very strong spices added. I couldn’t pinpoint these spices, but my best guess would be possibly some thyme and maybe chili powder. All I know is that they had a little heat generated from the spice. The stuffing generally had the same tougher consistency throughout instead of having a crispy outside and a warm, softer inside. All in all, an interesting flavor, but not one I prefer. Ok, now on to the main event. I started out pretty skeptical when I saw the price of the lobster roll. It was $18.95 and came with a small bag of Lays potato chips. Not fries or salad or coleslaw, but plain Lays potato chips… oh, and a yellowed pickle. 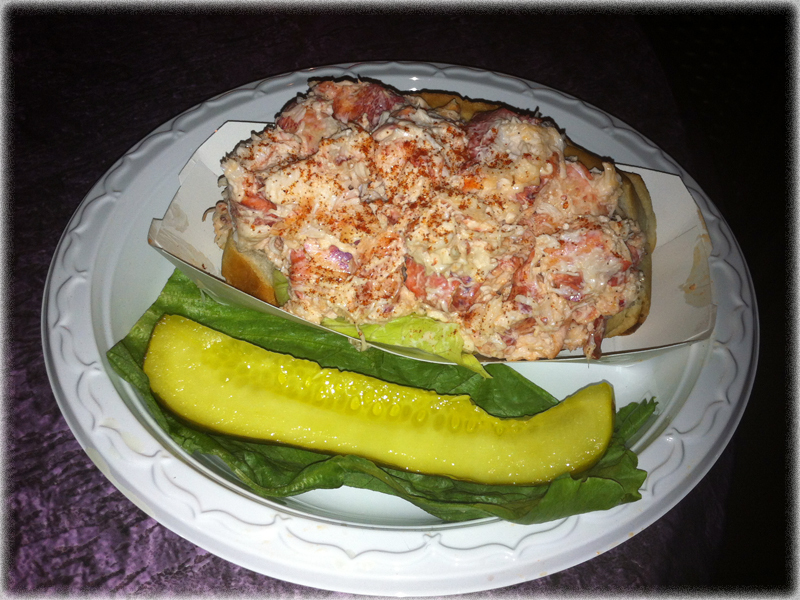 The best lobster roll I ever had from Matunuck Oyster House carries a price of $16.95 and it comes with fries! Anyway, I kept an open mind and ordered one. When it came out, I could already see the large chunks of lobster bursting out of the plain, lightly toasted, hot dog bun. This lobster roll has a ton of meat in it, so that was a huge plus in my book. I could already see that it had a little bit more mayo than I would like, but the lobster had such a good, fresh, flavor that I could still taste the lobster just fine. The only drawback, in addition to just slightly more mayo than I would like is that the bun was just a typical New England style hot dog roll. That means it was a bit too small to handle all of that lobster meat, so I had to use a fork at times. A larger, buttered, and toasted bun would go a long way to complimenting this already delicious sandwich. I would definitely come back to Tony’s, especially during the day time when you can see out across the water. They do a great job with their lobster roll and even though the construction could use some work, the flavor is wonderful. 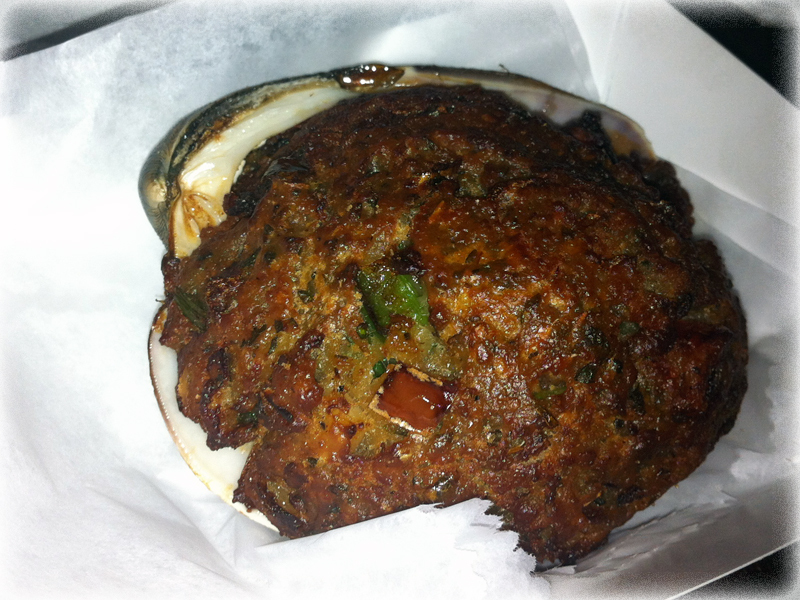 Pass on the stuffed clam and suggest that they get some chowder if you stop in! Rating: A bevy of fat twins on mopeds.